I just ran across a great post from Jeff O’Neal on the blog “Book Riot.” It’s called “7 Ways to Fake it at Book Club.” That title cracked me up because at some point just about everyone in a book group has had the problem of not having read the book in time for the meeting. 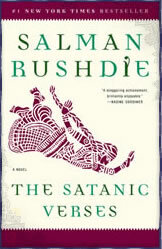 It seemed a particularly pertinent topic because my book club just read Salmon Rushdie’s The Satanic Verses, which is a slog, to say the least. Even the person hosting the group didn’t finish it. It’s a great book, won many awards, and Ayatollah Khomeini issued a fatwa against Rushdie (urging Muslims to kill the author) because the Ayatollah found the book blasphemous. The Satanic Verses is full of symbolism, dreams, commentary on the life of immigrants and much more, so it seemed like a great idea when we were choosing books. Still, for most people, it turned out to be a dense book that’s too easily put aside for all the activities of everyday life. To his suggestions, I’d add: think of other books with similar themes that you have read. It always seems smart to compare and contrast; it sounds like you know what you’re talking about. I’m in two book clubs and both are pretty serious about what we read. But, one reason we’ve been together for years and years is that we have an understanding that everyone won’t have read the entire book every time. In The Satanic Verses case, we all admitted that we hadn’t finished it. With that admission, we found common ground in discussing why it was difficult to get through. And, with a bit of research on Rushdie, the fatwa, and some help from Spark Notes, we had a great discussion of the book without having read it–not quite as good as the real thing, but close. …. And we all had our wine topped off. This entry was posted in Ideas for Book Clubs and tagged book club, reading, The Satanic Verses. Bookmark the permalink.